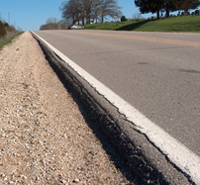 Pavement edge drop-off can be a serious safety concern when a vehicle leaves the paved roadway surface and encounters a significant vertical elevation difference between the paved roadway and adjacent unpaved shoulder. Edge drop-offs are potential safety hazards, because significant vertical differences between surfaces can reduce vehicle stability and affect the driver’s ability to control their vehicle when inadvertently leaving the paved driving area. In addition, scrubbing between the pavement edge and tire can result in loss of control. The Federal Highway Administration (FHWA) (2010) estimates that 160 fatalities and more than 11,000 injuries annually are related to unsafe pavement edges. The FHWA developed the Safety Edge based on results of research indicating that a sloped pavement edge surface could more easily be traversed by the driver of a vehicle leaving its lane and attempting to remount the pavement edge. The Safety Edge is a design feature that creates about a 30 degree fillet along the outermost edge of the paved section of the roadway. 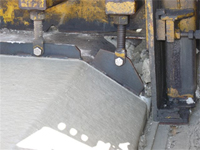 The Safety Edge is most commonly placed during hot-mix asphalt (HMA) paving, using a device that shapes and consolidates the asphalt material at the pavement edge into about a 30 degree fillet. The shape created by the Safety Edge reduces the likelihood that tire scrubbing will occur and provides a gradual, rather than an abrupt, transition back to the roadway as drivers of errant vehicles remount the pavement surface. Because use of the Safety Edge was relatively new to Iowa, the Iowa Department of Transportation (DOT) and the FHWA – Iowa Division commissioned the Center for Transportation Research and Education (CTRE) at Iowa State University (ISU) to develop educational materials, market the Safety Edge to Iowa counties, and conduct some early analyses of the Safety Edge. One of the project objectives was to encourage use of the Safety Edge by marketing it to state and local agencies in Iowa. With input from the advisory group, a list of potential projects where the Safety Edge could be applied was developed. A survey of counties identified planned projects for the 2010 construction season. These counties were then contacted to determine interest in using the Safety Edge concept. Participating Iowa counties added the Safety Edge to projects by contract plans or extra work orders, depending on project letting dates. When requested, the CTRE team provided various types of technical assistance, including project design recommendations, attendance at pre-construction meetings, open houses to demonstrate the Safety Edge, loan of equipment for actual roadway construction with the Safety Edge, troubleshooting, and monitoring of work. The CTRE research team also provided technical assistance as needed to agencies where the Safety Edge was used. The project resulted in a final report and three deliverables which can be used nationally by state, county and local roadway agencies. 1. Training Material for Local Technical Assistance Programs (LTAP): The CTRE team worked with a number of counties during the 2010 construction season to educate agencies and contractors and provide technical assistance before and during construction. The team developed materials to educate counties and contractors who had not used the Safety Edge before. Additionally, during the season, the team worked with agencies to resolve a number of problems that occurred during construction. Discussions with other state DOT and agencies indicated that they had also experienced similar problems but had not had the resources to look into or resolve the problems. Further conversation with the Iowa LTAP program indicated a need for resources which could be used to provide training for local agencies. Consequently a set of outreach materials were developed. This included a PowerPoint presentation which can be used for training and several tech transfer briefs. 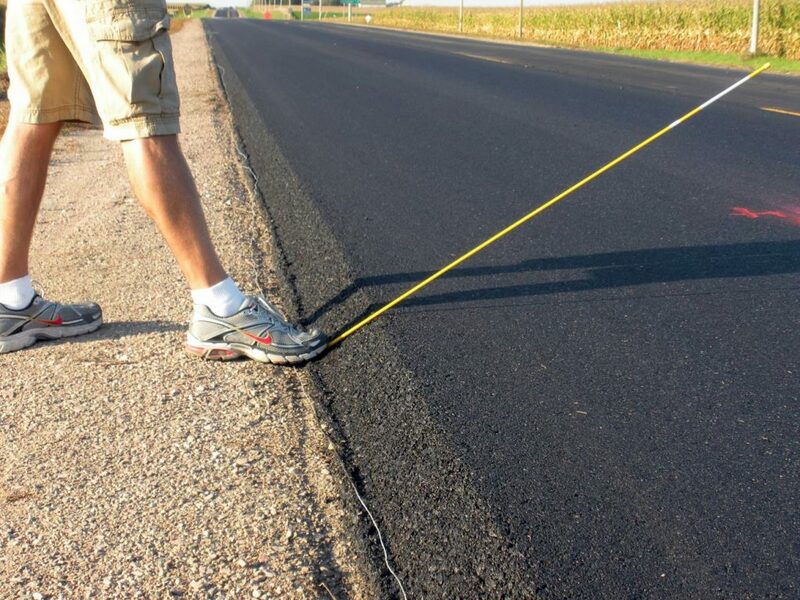 The material could be used by any Local Technical Assistance Program or roadway agency for training and includes the following information: (1) description of why pavement edge drop-off is a problem; (2) description of what the Safety Edge is; (3) quality assurance during construction; (4) contractor benefits; (5) lessons learned; (6) estimating additional cost of material; and (7) recommendations. 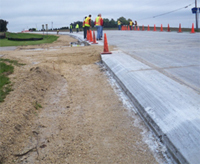 The team worked with an advisory panel which included FHWA, the Iowa DOT, Iowa counties, the Asphalt Paving Association of Iowa, the Iowa Concrete Paving Association, and several construction counties. As a result, the information has been vetted by a large group of knowledgeable peers. 2. Development of PCC Design Standard for the Safety Edge: At the commencement of this project, there were no properly designed applications of the Safety Edge on Portland Cement Concrete, (PCC) paving projects nationally as far as CTRE researchers or advisory team members were aware. With encouragement from FHWA, the CTRE team and the Iowa DOT worked to develop PCC Safety Edge design standards and specifications. This resulted in the first national demonstration of the Safety Edge with PCC on E-34 in Jones/Linn County, Iowa. 3. Iowa Lane Departure Strategic Plan: Results of the project also resulted in a chapter which was included in the Iowa Lane Departure Strategic Plan. The document is proposed guidance to reduce the number of roadway departure crashes in Iowa using countermeasures identified in the guide. The guide is used by the Iowa DOT, Iowa counties and cities. The material in the chapter supplements material developed for training and outreach.